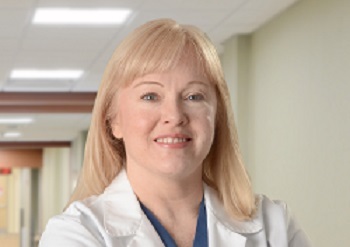 Dr. JoAnne McDonough of Round Lake has been named medical director of urgent care services at Malta Med Emergent Care. The emergency medicine physician is assigned to Malta Med full time, treating patients and overseeing all medical care at the facility. Although they were always available for consultation, previous medical directors also spent time providing care off site. The change in coverage reflects increased demand at the 24/7 facility—and is the latest example of Malta Med’s responsiveness to patients and the community. A joint venture of Albany Med and Saratoga Hospital, Malta Med opened in 2013 and has been expanding services ever since. In addition to urgent care, Malta Med offers walk-in lab and imaging services, including CT scans, MRI, ultrasound and X-ray imaging. “Malta Med has become increasingly important to the community, and our decision to increase coverage and oversight reflects that,” said Dr. Richard Falivena, chief medical and physician integration officer for Saratoga Hospital and medical director of Malta Med Emergent Care. Dr. McDonough has nearly 20 years of experience as an emergency medicine physician, most recently as chair of the Department of Emergency Medicine at Ellis Hospital. She holds Doctor of Medicine and Master of Public Health degrees from Yale University School of Medicine and School of Public Health, respectively, and completed a fellowship in emergency ultrasound at the University of California, Irvine. She is board certified in emergency medicine and a fellow of the American Academy of Emergency Medicine and the American College of Emergency Medicine. Earlier this year, at the request of patients, Malta Med launched online check-in for urgent care. The popular service lets patients check on availability and choose the time that’s most convenient for them to come in. Because patients provide symptom information to Malta Med ahead of time, staff can prepare for the visit in advance. Patients who have symptoms that are potentially life-threatening are prevented from making an online appointment and told to call 9-1-1 or get to a hospital emergency department immediately.